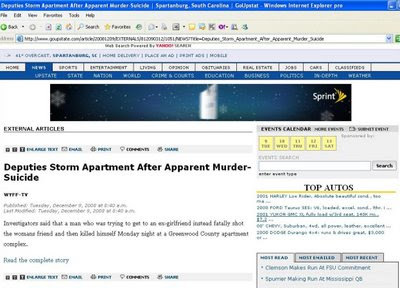 A local South Carolina newspaper added insult to injury when it committed an apostrophe catastrophe when reporting on a murder-suicide. See the line about the "womans friend" in the screenshot below. Thanks to another Becky for sending this one in. Murder-suicides are indeed tragic. But I don't know anything about "muder-suicide," which the title of your post mentions, so I can't comment on whether such a thing is tragic. Oh, man, how embarrassing.... At least this blog isn't called "Spelling Catastrophes." I Am Investment Paid Off? Who Is Lips Are These?